Sometimes one single learning delivery model alone can’t fulfill the complex learning needs of an organization. The solution here is to integrate learning content with blended learning solutions that offer cohesive learning experiences to users from all walks of life and help in performance improvement across the organization. 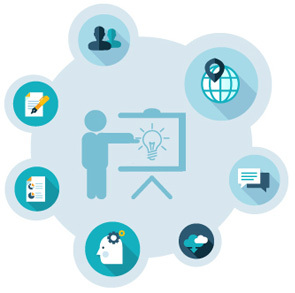 At FCS Learning Solutions, we incorporate both instructor-led training and eLearning modules to create custom blended learning solutions that fit seamlessly in your existing learning system. Our blended learning solutions help in delivering complex learning through mediums your audience most familiar with. We use blended learning approach to create course content that includes webinars, classroom sessions, eLearning, self assessment tools, practice papers, and real-life scenarios. The courses can be delivered either through learning management systems or classroom teaching. The objective is to ensure a long lasting and positive impact of learning on your audience that reflects in their performance and daily work activities.